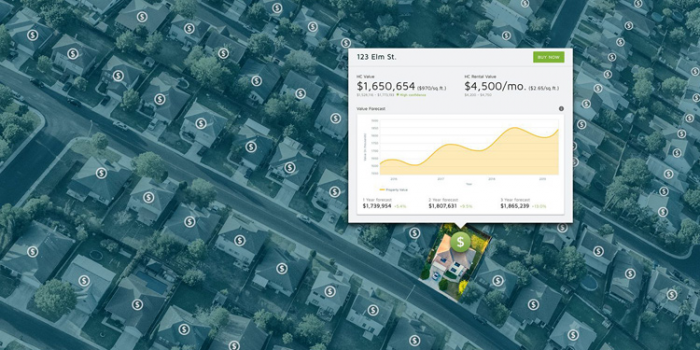 HouseCanary, a real estate analytics company leveraging data science to accurately value and forecast over 18,000 U.S. residential markets and 100 million properties, yesterday announced its Series A funding round with $33 million in backing from prominent technology investors, including Hillspire (Alphabet Executive Chairman Eric Schmidt's family office), Alpha Edison, ECA Ventures and Raven Ventures. The data-driven company is part of a wave of technology-fueled transformation sweeping the $36 trillion residential real estate industry. HouseCanary is using its massive data set, predictive analytics and visualization tools to help investors, lenders and other real estate professionals accelerate decision-making in an industry mired with fragmented and incomplete data. "We want to do for residential real estate what Bloomberg did for financial services – build a platform that will be a beacon of accuracy and transparency, enabling greater speed and confidence in residential real estate transactions," said Jeremy Sicklick, CEO and co-founder of HouseCanary. Inaccurate real estate valuations played a significant role in the financial collapse of 2008. Before the recession, millions of homes were purchased, loans were made and mortgage-backed securities were issued at irrational valuations. These legacy real estate processes were augmented by incomplete, expensive and error-prone data, even at the most sophisticated institutions. HouseCanary aims to change the paradigm by applying an exhaustive approach to ingesting, scrubbing, organizing and analyzing data on 100 million U.S. residential properties in an effort to create a single source of reliable, accurate insight. The desired result is a comprehensive residential data set, combining data architecture, advanced modeling, predictive analytics and machine learning to set a new standard in residential property valuation and forecasting accuracy. Real estate investor Blackstone Invitation Homes, Sotheby's International Realty and the top three mortgage lenders are among the companies using HouseCanary analytical products. HouseCanary's customers span institutional investors seeking properties to fit their investment criteria, lenders looking to identify prime mortgage prospects and real estate brokerage firms looking to build advisory relationships with their clients. "People are incredibly frustrated with not being able to price homes correctly," said Mark Dyne, chairman of ECA Ventures and one of the original investors in Skype. "HouseCanary will enable investors, lenders, realtors and even homeowners to understand everything there is to know about a property and make investment decisions in seconds – and at a fraction of the cost. This company has all the ingredients to disrupt a multi-trillion-dollar asset class." Leading the team at HouseCanary are CEO Jeremy Sicklick and the company's Chief Scientist, Chris Stroud. Prior to to this role, Sicklick was a partner and managing director at The Boston Consulting Group. Following the collapse of Lehman Brothers in 2007, he was tapped to value real estate assets for several developers and private equity clients. He soon discovered that the industry lacked a standard for valuing properties. Sicklick partnered with Stroud, an economist and statistician who was writing his Ph.D. dissertation on Dynamic Models of Financial Risk at the University of Texas in San Antonio. Stroud delayed his Ph.D. to help Sicklick co-found HouseCanary three years ago. "Data is behind virtually every significant industry transformation," Stroud said. "By systematically gathering and analyzing terabytes of data from every county in the United States and some 10 million U.S. Census blocks, HouseCanary has set itself up to be the trusted source for residential real estate information now and into the future."